In a high school in Barrow, students sit in a dark room watching a screen. A young Inupiaq girl and an Arctic fox are running across the screen, jumping from ice floe to ice floe. “A bear!” a student calls out as a polar bear emerges from the water growling. Students holler and laugh as the characters run across the screen. “Just keep running, don’t look back,” another student urges. They’re watching a demo of Never Alone, a game its creators hope will set a new standard in videogame development. Until recently, no videogames on the market have told the story of an indigenous people from their perspective. But a group of Alaska Natives have partnered with a game developer to change that. Like in movies, Native characters in video games tend toward stereotype. And few are heroes. But this game’s different. It’s based on a traditional story known as Kunuuksaayuka and the experiences of Alaska elders, storytellers and youth. The story follows a young Inupiaq girl and an Arctic fox as they go on an adventure to save her village from a blizzard that never ends. Game developer Sean Vesce has 20 years of experience in the industry working on big-budget action titles. He went to Barrow to watch the students play a demo of the game. He says that day was his most memorable experience from the project. “It was such a special moment because they were literally sitting forward, you know yelling and screaming at the players to avoid enemies and to navigate around obstacles,” he says. Vesce’s introduction to Alaska Native storytelling began two years earlier. It arrived in boxes of transcribed stories. He says they contained tales and creatures as interesting and imaginative as anything in the movies today. “We were just blown away at the richness and the beauty and the depth of that storytelling tradition and we realized that none of that had really been ever explored in a videogame,” Vesce says. Vesce says it was a perfect match for what they were envisioning for the gameplay. The team also wove elements, characters and themes from other traditional stories to create a mosaic. But it wasn’t enough to just read the stories. The team needed to really know the people the stories came from. Vesce made a dozen trips to Alaska with his team to gather more stories and imagery that will be used in the game as unlockable content. Amy Fredeen helped connect Vesce with the Native stories. Fredeen is Inupiaq and the cultural ambassador between the developers and the community. She says in Native culture everybody depends on each other and that was the most important part of both the game’s story and creating the game itself. “The last thing we wanted was this game to be kind of a cultural appropriation. We didn’t want this to be an outsider’s view of what the Inupiaq culture was. We wanted it to come from the people themselves,” Fredeen says. One connection Fredeen made was with Jana Harcharek, who works in the Barrow school district to promote and preserve Inupiaq culture. Harcharek says when the students learned that the developers wanted to hear from them, the kids began telling their own stories. “The ideas just started coming out. They were like ‘well, are you going to be able to maybe do this, because I’m a whaler and I’m a hunter and I have this experience and it would be really cool if we could make this happen or that happen.’ There was a lot of excitement right from the start,” she says. Harcharek has had her own doubts about videogames. She doesn’t allow her kids to play them. She says most are just too violent. But she was intrigued by Never Alone. “We need to ground our children to who they are in whatever medium we can find to be able to do that,” Harcharek says, noting that she’s going to let her grandkids play this game. 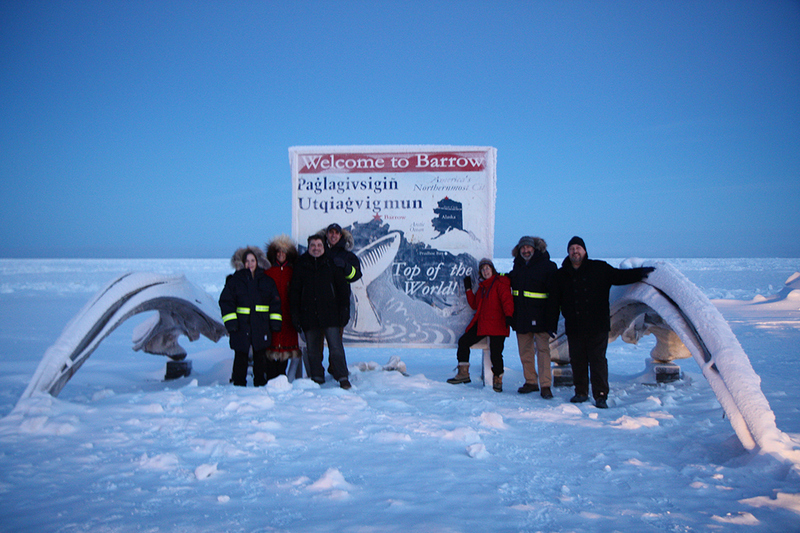 Harcharek helped the development team meet members of the Barrow community. “When I was privy to having a conversation with some of the folks that were interviewed there were expressions of things like ‘that is really cool. This game is going to be so awesome. That was—‘and they’ll just start shaking their heads in some cases because what a concept, putting traditional stories together with gaming. Whoever would have thought of that,” she says. The idea for Never Alone came from the Cook Inlet Tribal Council in Anchorage. Two years ago, President and CEO Gloria O’Neill asked developers if games could be used to share traditional stories. “It was an incredibly inspiring set of conversations because she asked, ‘Can games be used to transmit cultural values, cultural wisdom, history and heritage. Can it be used to pass that wisdom from one generation to the next. Can it be used to share that with a wide audience?’ And up until that point I had been doing a lot of action oriented games like Tomb Raider and giant robot games and things that were purely entertainment, so the idea to use games for social impact was really intriguing,” Vesce says. O’Neill says the tribal council was looking to invest its money in a way that would also benefit Native culture. “We started thinking about the future because our board also said to us, ‘Never forget who we are and where we come from, but think about how we can connect with our young people in the future,’” she says. Over time, O’Neill started to believe that the perfect way to do that is through videogames, something even people in the most remote parts of Alaska want to play. “Not only we could make money with the right partners, but we had a medium in which we could share our culture with the world; that we could create this invitation of courageous learning with the world,” O’Neill says. At the time, there were no indigenous gaming companies in the U.S. O’Neill says the tribal council wanted to fill that space. They joined forces with E-Line Media to form Upper One Games. 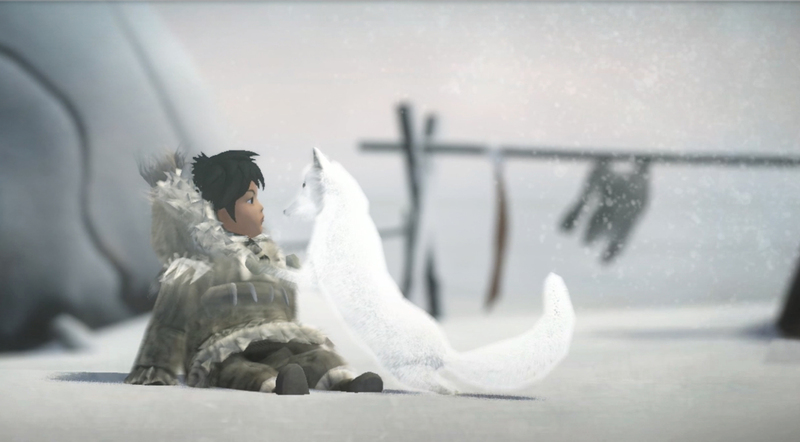 Never Alone is its first big title. Everyone involved with the project saw it as an opportunity to right some wrongs in how Alaska Natives are portrayed in the media. “I was initially a little nervous about seeing the traditional Inupiaq stories and my culture portrayed in a game, because you know, honestly, we haven’t seen a lot of great media out there that portrays Alaska Natives the way they should be portrayed,” Fredeen says. Fredeen says the game sets the bar for other developers who may want to do games based on different cultures by showing them how to include the people from a culture in the development process. The team thinks the game will appeal to a variety of gamers. O’Neill and Vesce both identify indie gamers and a group they call “cultural creatives” as the kind of players who want the story Never Alone will offer. “Folks who really care about not only having a meaningful experience when engaging in a game, but also those who want to learn something as well,” O’Neill explains. O’Neill says the team was at Harcharek’s house in April and her grandkids were playing a version of the game. She said the moms became interested and were soon on the floor playing the game with their children. That is just the kind of exchange they hope to see happen with the game she says. “Just to have a product in the market that all Alaskans, especially those Alaskans who are of the Inupiaq community, can be proud of, that would be a success for us,” O’Neill says. Never Alone is slated for release later this year.